When Modi and Manmohan hit out at eachother! Prime Minister,Dr Singh and Gujarat Chief Minister,Narendra Modi, shared stage in Ahmedabad while inaugurating the renovated Museum of Sardar Vallabh Bhai Patel. 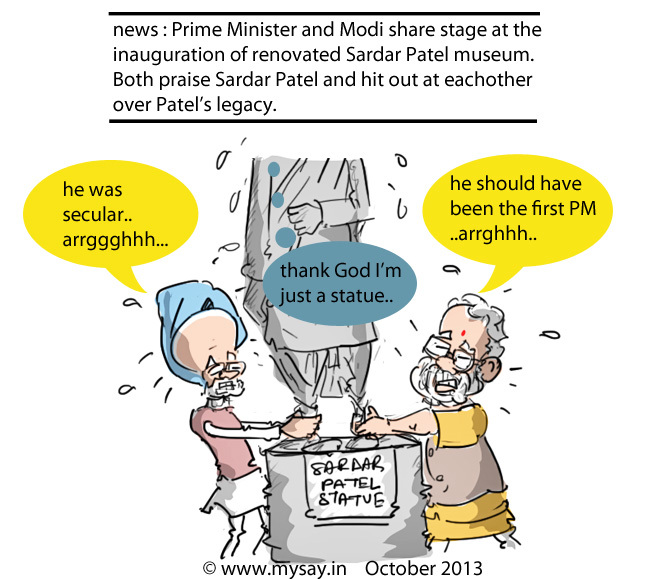 Both the leaders praised Sardar Patel for his contribution as a patriotic politician of his times and took the opportunity to hit out at eachother as well.Modi said Sardar Patel deserved to be the first Prime Minister of the nation and had he been the PM the fortune of the country would have been different.Manmohan Singh countered Modi by stating Sarder Patel was a secular man and that he and Nehru(the first Indian PM) had deep mutual respect. As per the Minister of External Affairs,Salman Khurshid, the Indian Prime Minister,Dr Manmohan Singh had given a very straight forward and crisp answer to Pakistani Prime Minister,Nawaz Sharif on the Kashmir issue when both the PMs had met in New York alongside UN General Assembly. 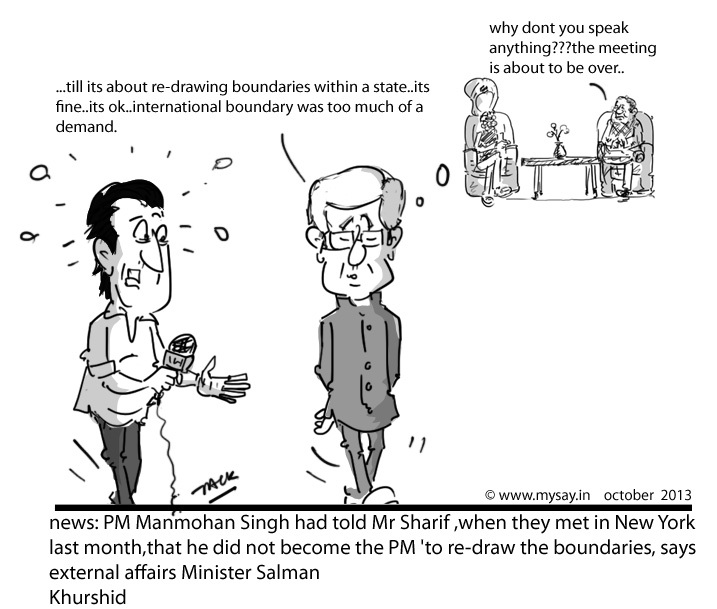 According to Khurshid,Dr Singh declared he did not become the PM of India to re-draw boundaries,to Nawaz Sharif. Guess this statement was limited to re-drawing International Boundaries only because it is the same Dr Singh led UPA Govt which has recently re-drawn boundaries of a state once called Andhra Pradesh and given birth to new states of Telangana and Seemandhra attracting criticisms and praises,simultaneously. 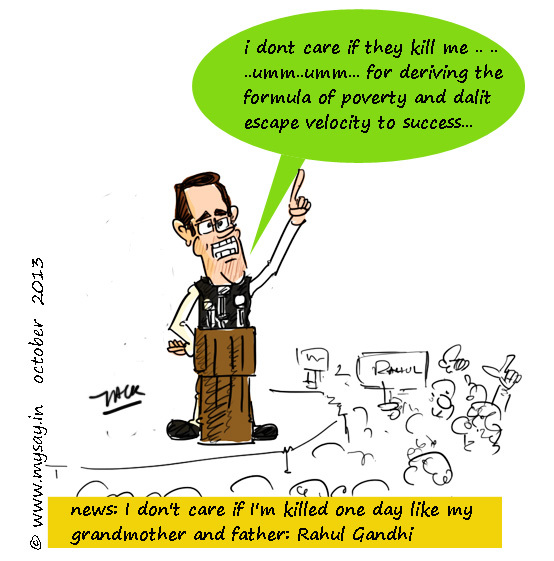 Rahul Gandhi, in a rally got emotional talking about divisive politics blaming BJP for doing the same and spreading gatred.He said hatred killed his grand mother, Indira Gandhi and father Rajiv Gandhi and that he did not care even if he gets assassinated some day. In an interview, Sheila Dikshit,the CM of Delhi said she hopes to win it for the 4th time for her party,Congress, and also admitted that although activist turned politician , Arvind Kejriwal, has managed to catch people’s imagination but she has sincere doubts on the conversion of the same into votes. After all, Kejriwal and his party,AAP , is undoubtedly too new to fight the big guns of the politics keep aside winning. Find more Arvind Kejriwal Cartoons here. 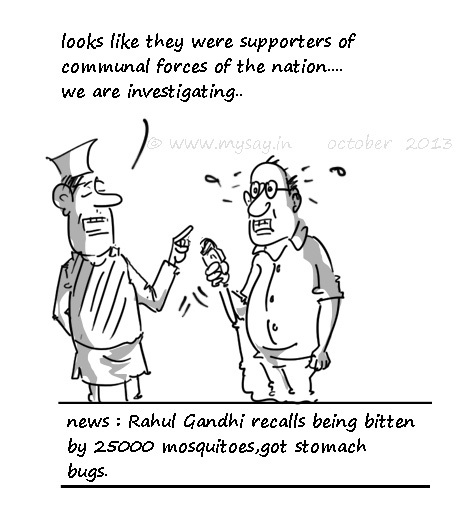 Find more Sheila Dikshit Cartoons here.